If you spend enough time fishing, eventually you will catch the big one. You just need to keep casting your line into the water, patiently waiting for one to take the bait. Great fishermen and fisherwomen will tell you it just takes patience and putting your line in the water to catch fish. I work with one of those nameless great fishermen who keeps casting his line into the water. He keeps fishing and fishing and fishing. Hoping to catch the big one. The lunker. That beast in the pond he knows is out there waiting to be caught. And so he casts his bait into the water to see if he can catch the big one. That trophy fish to mount upon his wall. Actually, the nameless fisherman I work with is a catch and release fly fisherman. He likes the sport of it all. He likes the stories. And of course, he likes the hunt. But he always throws the fish back. But my nameless fisherman friend, Dan, does not just go after trout and other game fish. In fact, one of his favorite prey is not a fish at all. Dan likes to fish for rookies. Indeed they have been his most elusive quarry in the nearly twenty years I have known him. Of course, most of them have gotten away, but he finally caught the big one. There is no hazing that goes on at the high school where I work. Not even much razzing toward the new staff who come on board each year. However, those rookies do need to beware. For Fisherman Dan likes to throw his line in the water to see if he can catch a sucker. Dan does not pull little pranks on newbs like putting whoopee cushions on their chairs during lunch. Nor does he try to pull the wool over everybody’s eyes every chance he gets. After all, he is subtle and does not want to ruin the bait for the big catch. So he is Helpful Dan to the rookies and lets them know that the staff dresses up in their own graduation robes every year at graduation. To show support for the students. After all, why should they be the only ones who must wear choir robes? Devious Dan knows that there are schools out there where the staff actually does this. And he knows that others know that there are schools out there where the staff does it. So he always tells the newbs, the rookies, that they need to get out their robes from the backs of their closets in time for graduation in June. He casts his line out each year into the pond of newbs to see if anybody will finally bite. Deadpan Dan keeps a straight face whenever he broaches the subject of graduation robes and keeps the façade when he reminds the newbs to search their closets every once in a while. But he has never had anybody take the bait. In all the years I have known Dan, he has not had one taker. Until last year. 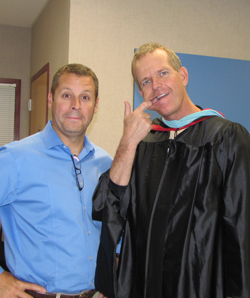 Last year, a veteran teacher who came from Montana finally listened to Deceitful Dan. 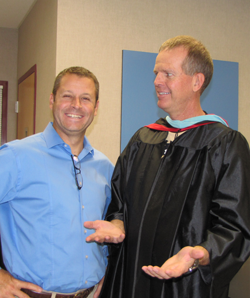 Our unnamed science teacher newb, Justin, actually believed he was supposed to wear his graduation robe to the ceremony. Dan looked sincere enough. And nobody ever laughed or contradicted him when others were around. I was not there, but I am sure Dan broached the subject at lunch one day. People would have supported Dan and his joke right up until the end. Many, including myself, hoped to see Justin at the ceremony with his graduation robe on. It was easy to support Dan’s joke because nobody had taken him seriously in all the years he had told people it was the tradition. Year after year all the rookies saw through his serious face. They would look to others for confirmation and even when they got it, they would still see the collusion. They might have nibbled at the bait, but none of them took it. When the lone exception (so far) took the bait, he took it hook, line, and sinker (even though fly fishermen do not use all of those gadgets). Justin looked for his graduation robe and when he decided he did not have it, he actually ordered one. When it came in the mail he excitedly told Dan. I would have loved to have been there at the revelation. Delighted Dan’s eyes surely lit up with excitement. A smile wider than the Cheshire Cat’s or the Grinch’s surely crept over his face and Justin knew he had been had. The jig was up, but G-man Dan finally got his man. I am sure Dan will continue to cast his line in the water for the newbs. After all, even though he finally caught his lunker, his trophy fish, he is still a patient fisherman. He will continue casting his line each and every year to see if there is another big one out there. Another one for his trophy case and a story of one that did not get away. Which is why I wrote this story in the first place. Not to warn the rookies, but to tell the story of Determined Dan’s success. After all, what fisherman does not want his big fish story told. Or better still, embellished. Still, I must admit that I also write this fisherman’s tale as a warning to the rookies. Beware the fisherman. He finally got one, but he will surely not be satisfied with a single newb. And most of the rest of us will go along with the ruse just to see if Dan can catch another big fish. After all, even if all he does is catch and release, for Fisherman Dan, it is always open season on rookies. And who knows, if he keeps casting his line out, he might catch another big one.